Pour 6oz of water into a microwave safe container and heat for 1 minute on high. Mix the hot chocolate and water in the container. Then pour the hot chocolate into the espresso cups. Top off each with a donut and Pirouette. Enjoy them with or without Bailey's Irish Cream! They are a delightful snack to finish out a night of "mini" treats. 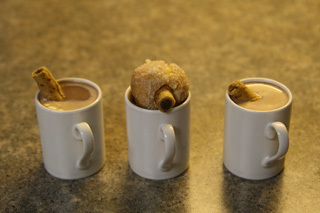 Note: it is recommended that if you use donut holes, you place a toothpick through the center and set the toothpick on top of the espresso cup so they do not sink into the hot chocolate. Our first attempts were quite messy, though delicious!